This is the first thing that sprang to mind when I saw the new card layout. I was inspired by Jay to actually mock it up, and I think the gain in size of the art is pretty apparent. There's also some gains in the text box/type line, but I'm not sure that it's really enough to do too much. Feedback is appreciated! Happy tinkering. That's fascinating. I had never anticipated criticism that this would make otherwise lackluster cards too "splashy". I also hadn't really made the connection to Planeswalker frames of that they might make those feel less special. I never thought I'd ever make that kind of criticism. But that's the weird thing: that frame looks kinda... wasteful? I guess? It's hard to articulate. This version makes me want the bottom to be red all the more. And maybe the border too, if that were possible (probably not—but you never know). I can't imagine they could match border color (the sides of your deck would be visible without sleeves). 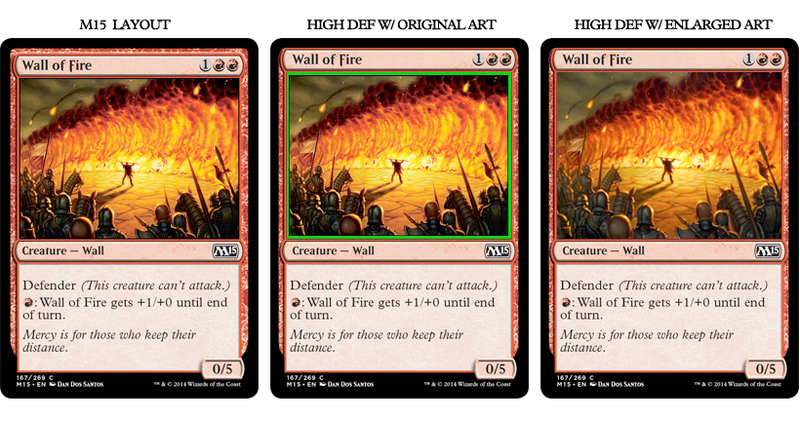 Based off the comments above, do you feel like the Planeswalker frame had too much black at the bottom? And now I know where that curvature comes from. Neat. The planeswalker frames have grey at the bottom. It's dark, but it's definitely not black. It's also not quite as large as the M15 frames. Even so, your point does help me understand how they settled on this frame. I second Bass here. 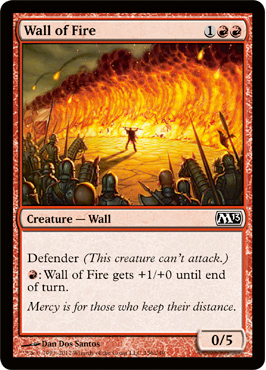 My favorite thing about all this new frame talk is how much player's are discussing and care about Wall of Fire. I'm not! 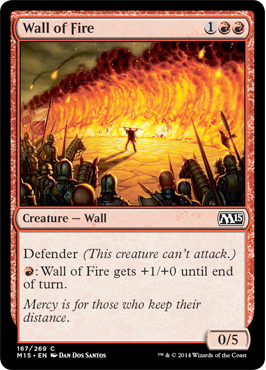 I'm tired of all these apologists for Wall of Fire. All they do is defend it's terrible, terrible, heat-crimes.